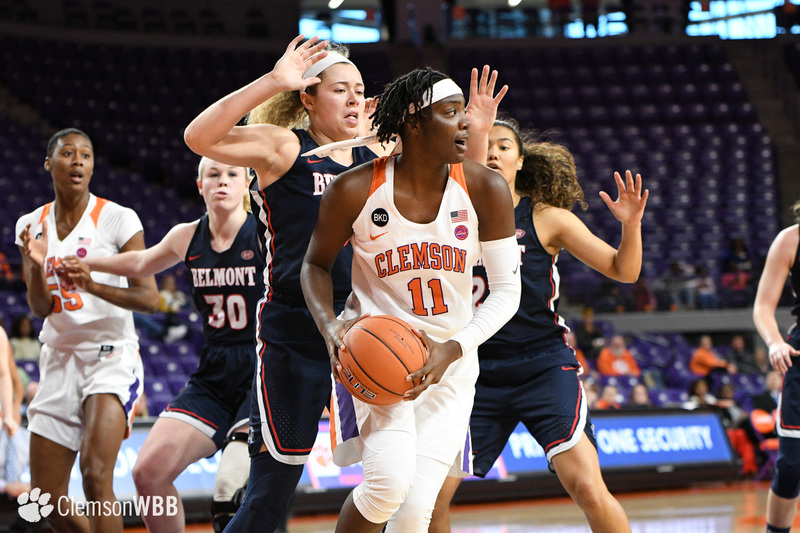 CLEMSON, S.C. — Continuing to thrive in pressure situations, the Clemson Tigers improved to 5-3 after pulling out a 65-62 victory over the Belmont Bruins (4-3) at Littlejohn Coliseum on Sunday. 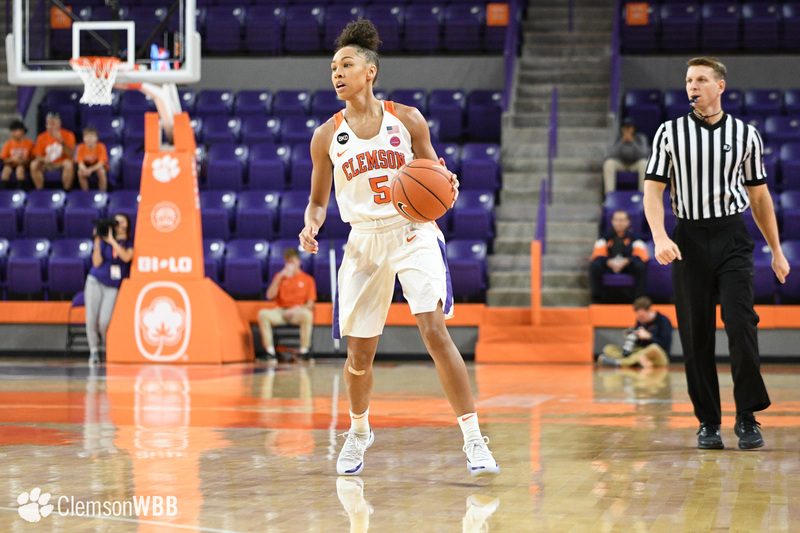 Senior Danielle Edwards led the charge for the Tigers with 17 points, converting several pivotal 3-point plays down the stretch stave off the Bruins. 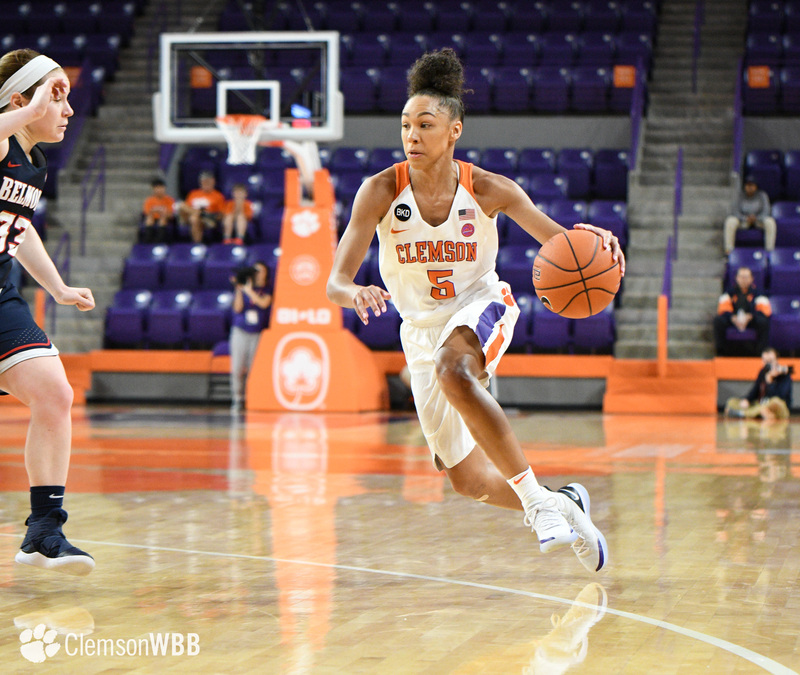 Edwards paced the Tigers on offense, shooting 5-for-12 from the field en route to her fourth double-digit game of the season. 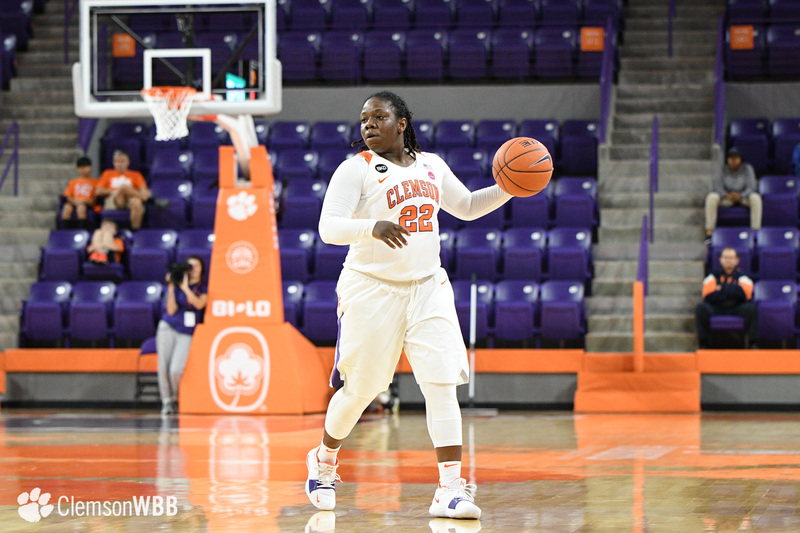 The senior floor general also dished out six assists, tying her season-high. 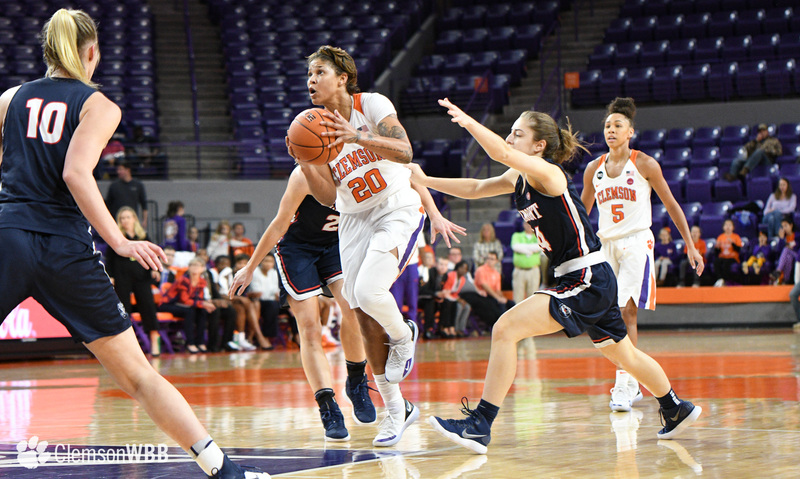 Forcing 19 Belmont turnovers, the Tigers used a well-balanced effort on defense to pull out the win. 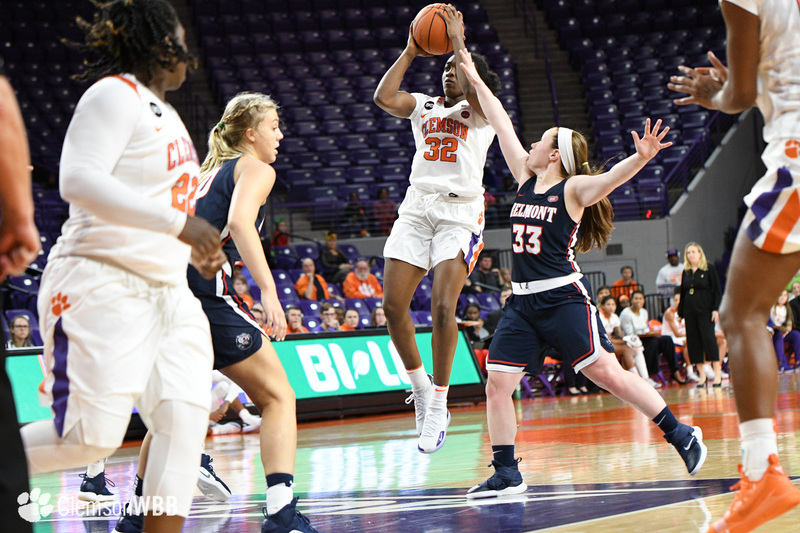 Guard Simone Westbrook tied her career-high with eight boards, while sophomore Tylar Bennett pulled down a game-high 11 rebounds. 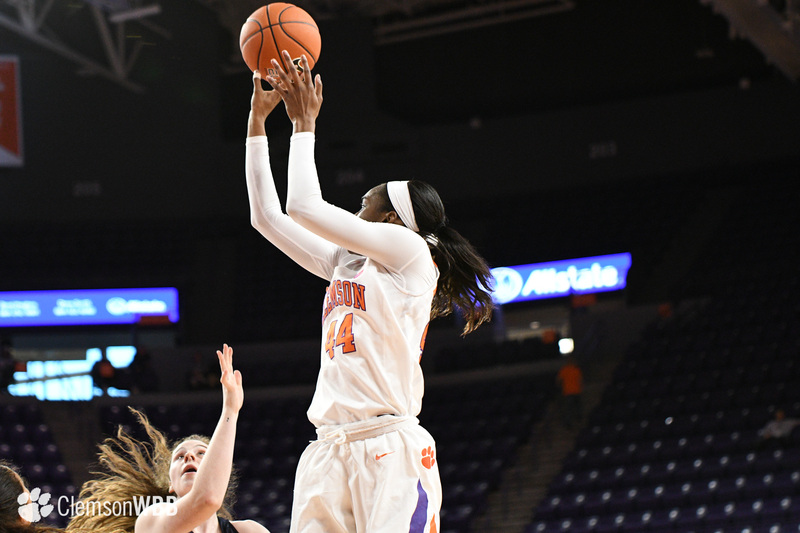 Edwards sunk a layup on Clemson’s opening possession to get the Tigers off on the right foot. 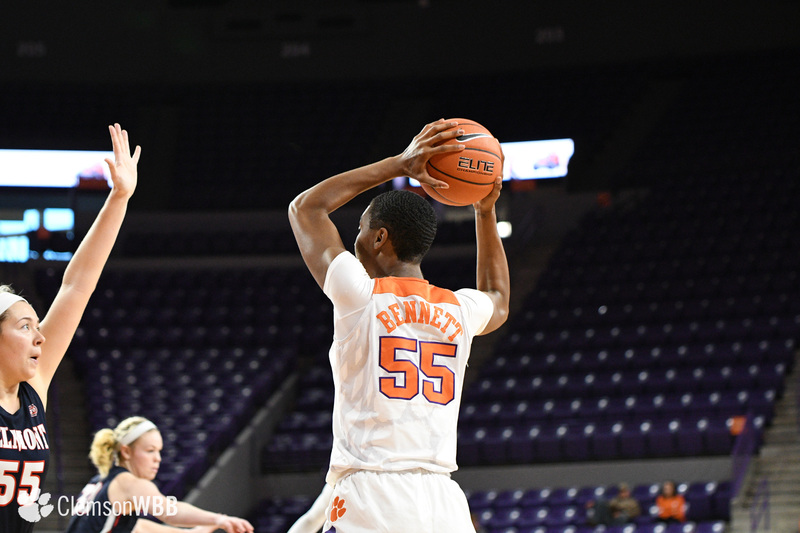 The first quarter proved to be a defensive war of attrition, with both teams suffering several turnovers. 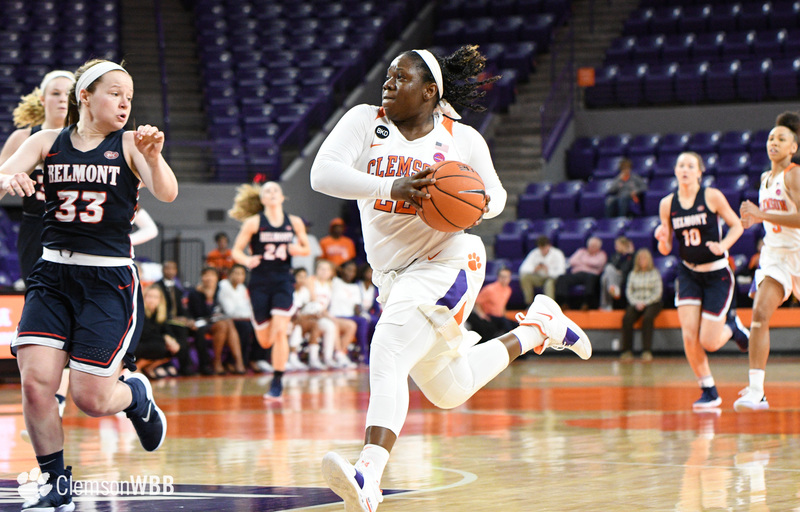 Forward Kobi Thornton braced the Tigers with six points on 3-of-4 shooting, but Clemson found itself in a 13-13 deadlock at the end of one. 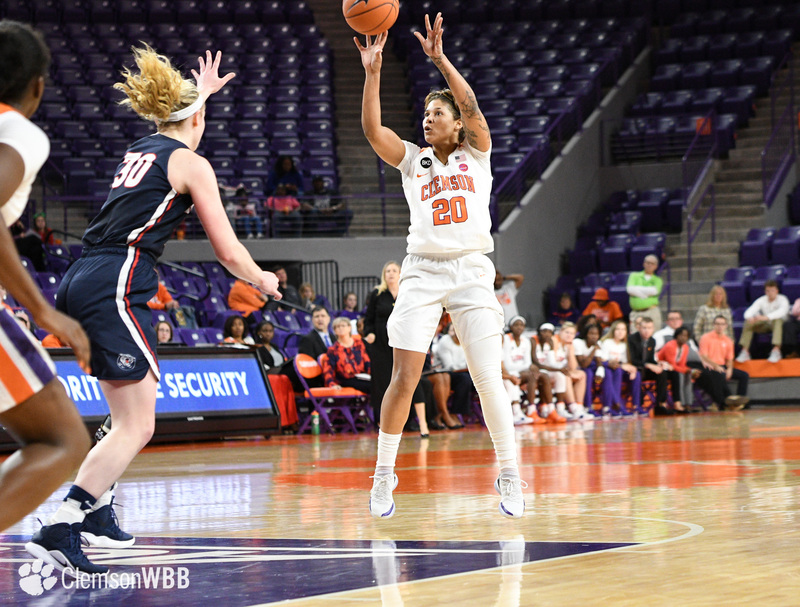 The second quarter was all Clemson as the home team controlled the action and outscored the Bruins 20-7 to take a 13-point lead into halftime. 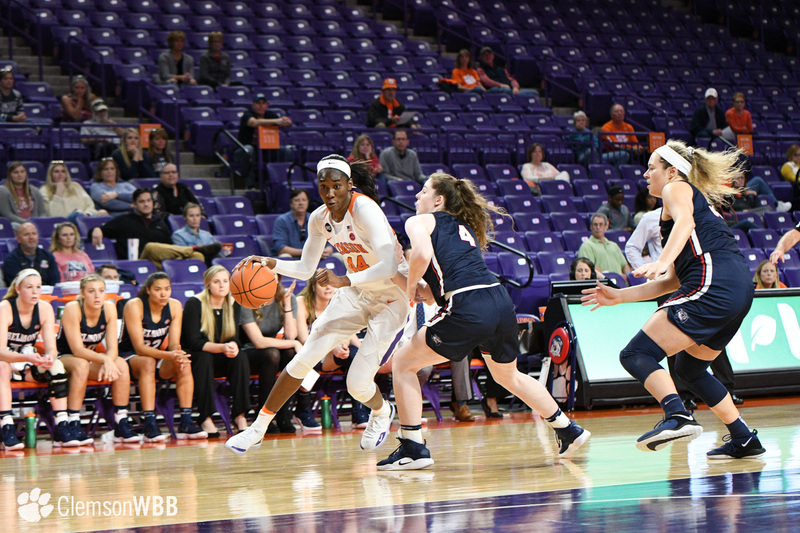 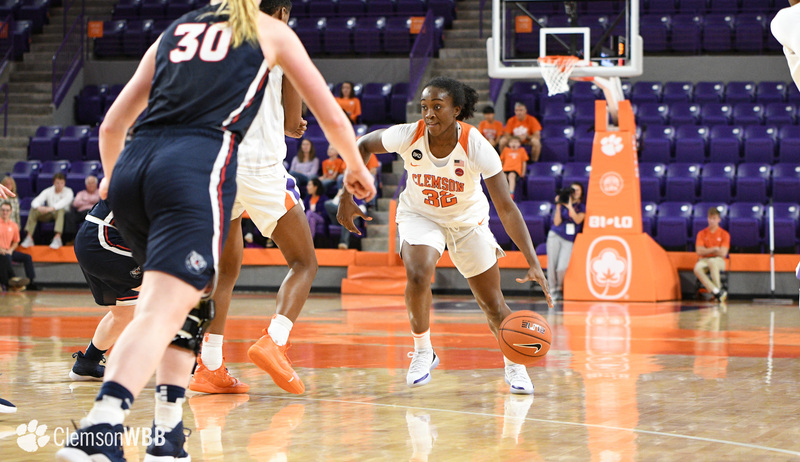 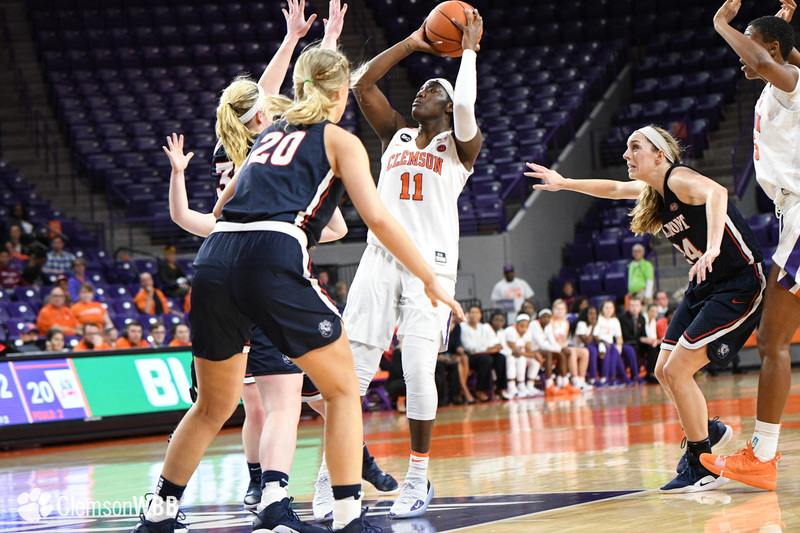 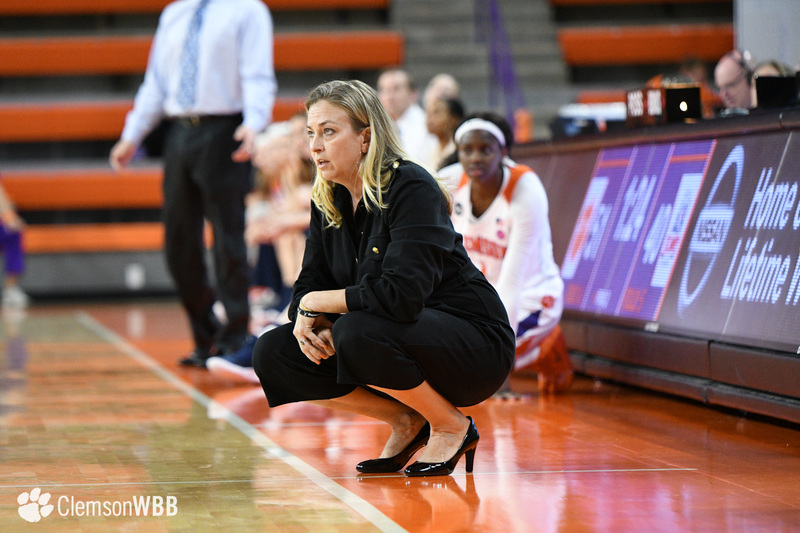 Edwards also made her presence felt on defense, accruing steals on back-to-back Belmont possessions to facilitate a pair of Clemson layups with under four minutes remaining in the quarter. 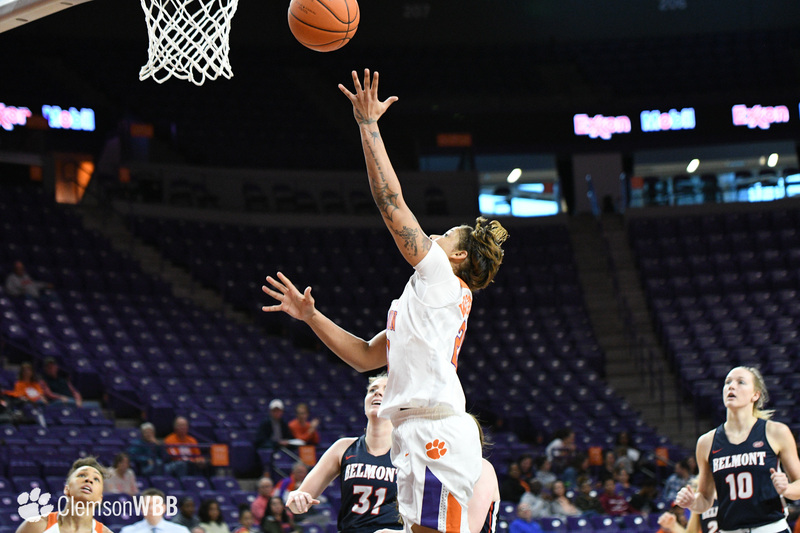 Highlighted by yet another 3-point play from Edwards, the Tigers closed out the first half on a 13-0 run to lead 33-20 at the intermission. 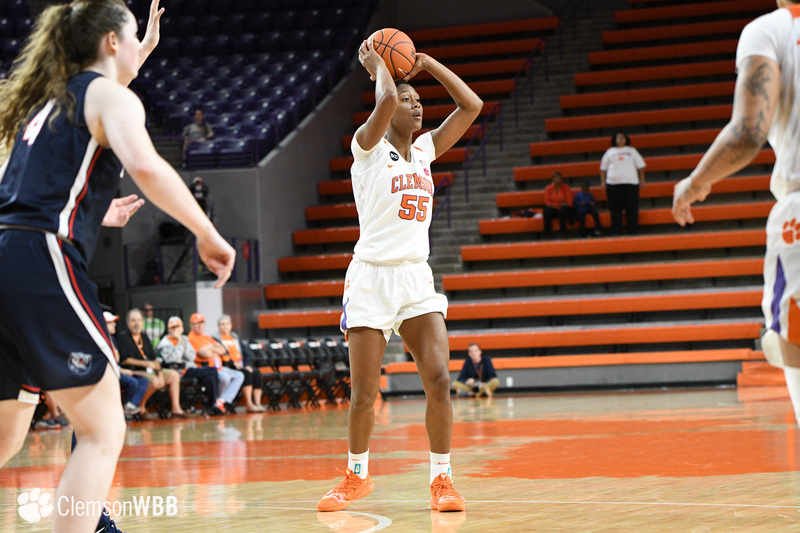 Clemson remained aggressive out of the break with guard Simone Westbrook turning a steal into a layup less than a minute into the third frame. 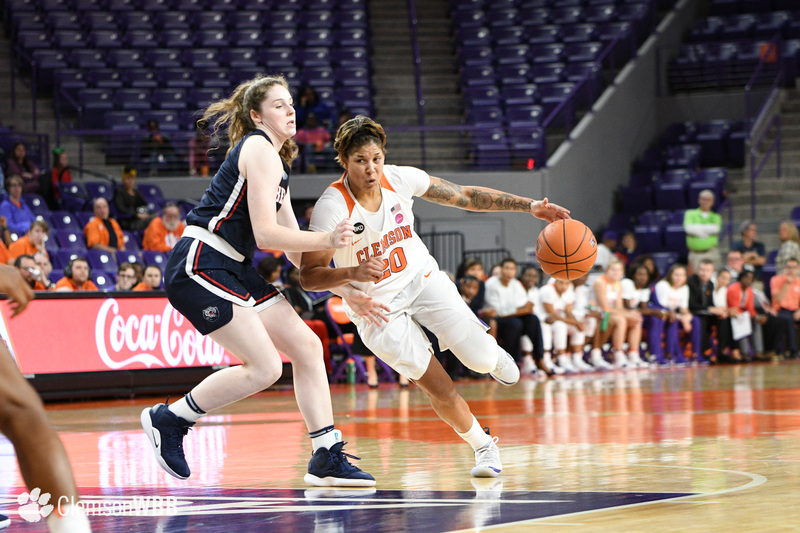 The Bruins answered with a 10-2 run shortly after to close the scoring gap. 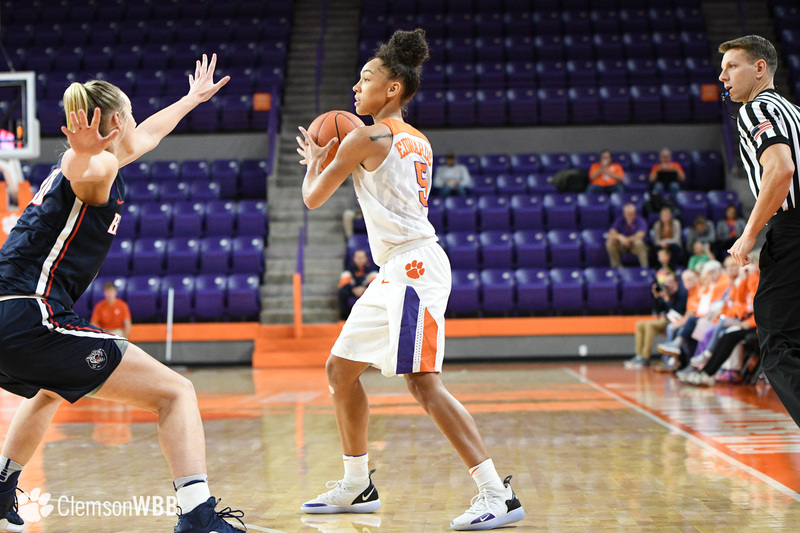 With 2:29 to go in the third, freshman Taylor Hosendove beat the shot clock for her first career three ball, putting Clemson up, 49-38. 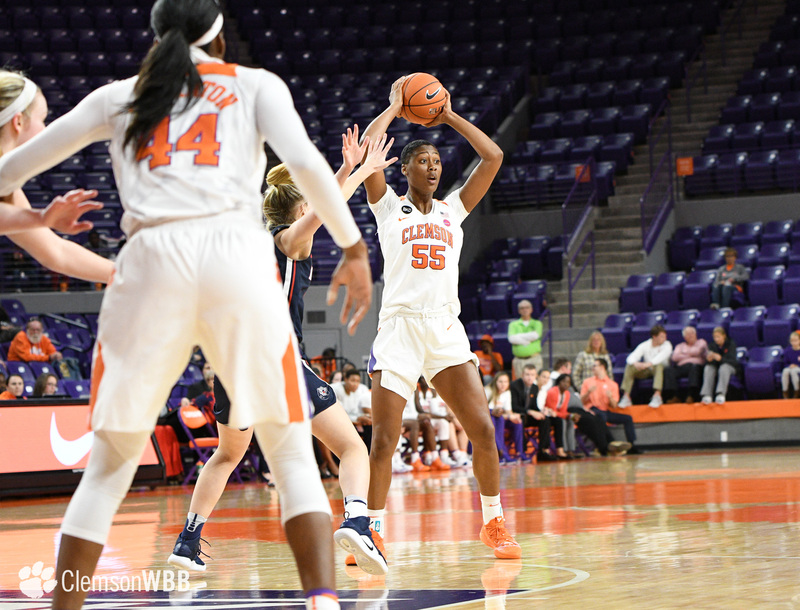 Boasting a nine-point advantage at the start of the fourth quarter, an intense battle to the finish took place with the Tigers holding their own and keeping the Bruins at bay. 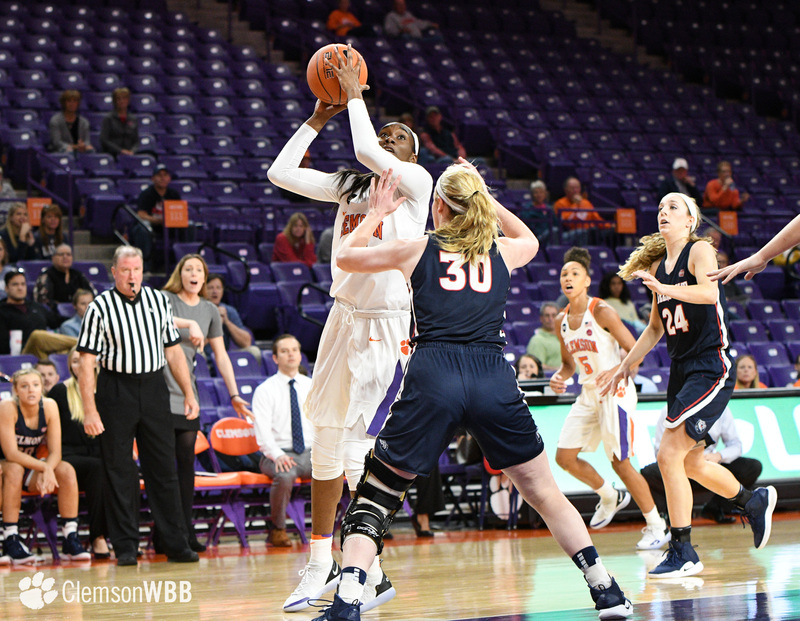 Defense the difference maker in the final frame as Clemson forced five turnovers and outrebounded Belmont, 11-10, to hold on for the win. 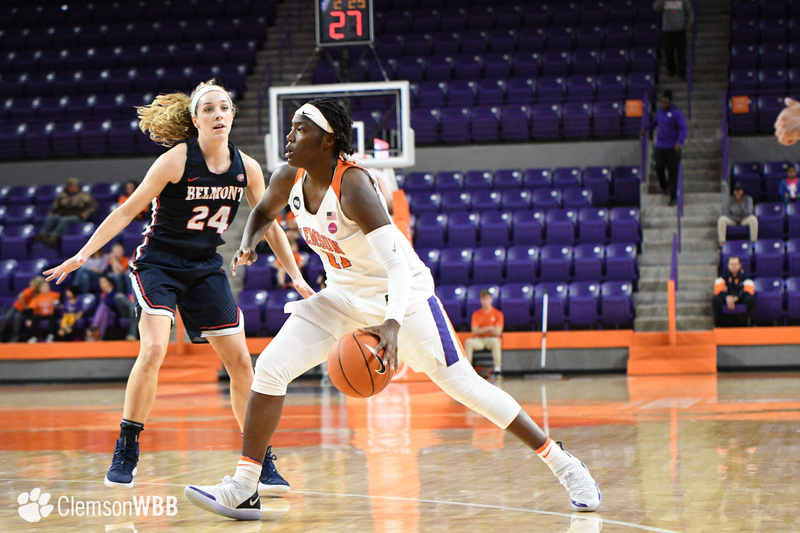 Belmont lived by the three ball on the afternoon, going 11-of-30 from beyond the arc. 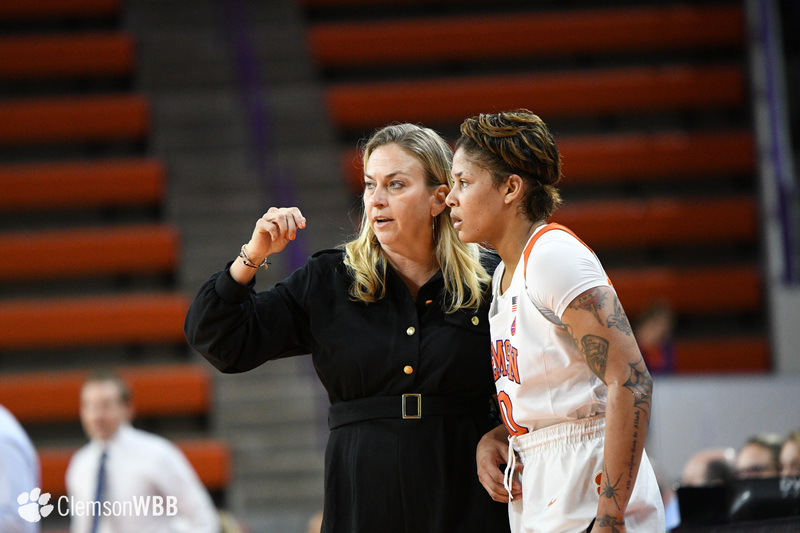 Guards Maura Muensterman and Jenny Roy, who each made five 3-pointers, led the Bruins with 17 points apiece. 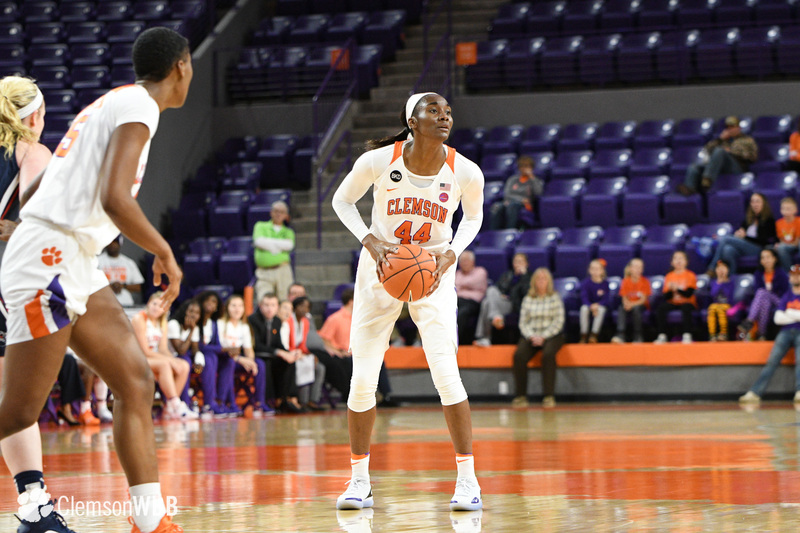 The Tigers continue their seven-game homestand on Wednesday, Dec. 5, when they host High Point for a midweek matchup. 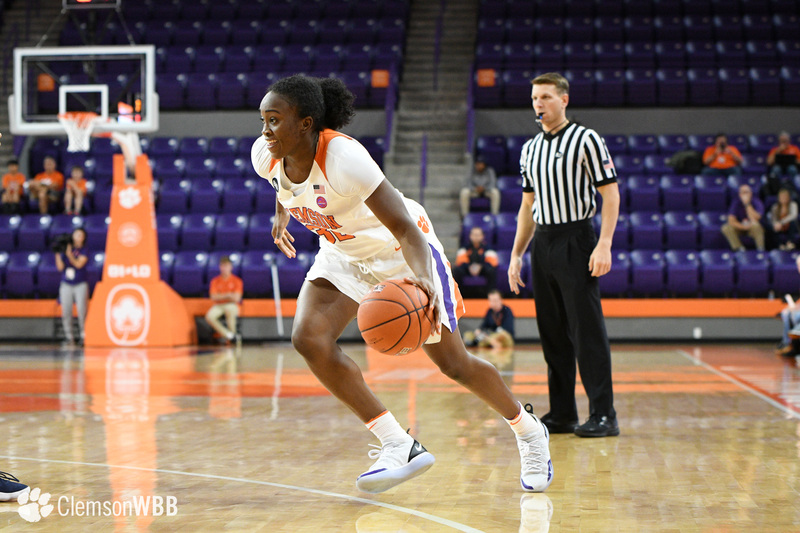 Tipoff is slated for 7 p.m., and the game can be streamed on ACC Network Extra. 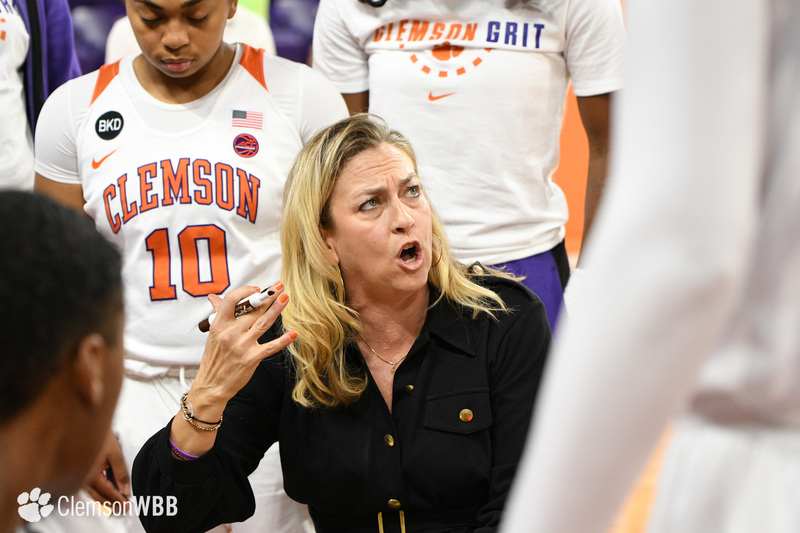 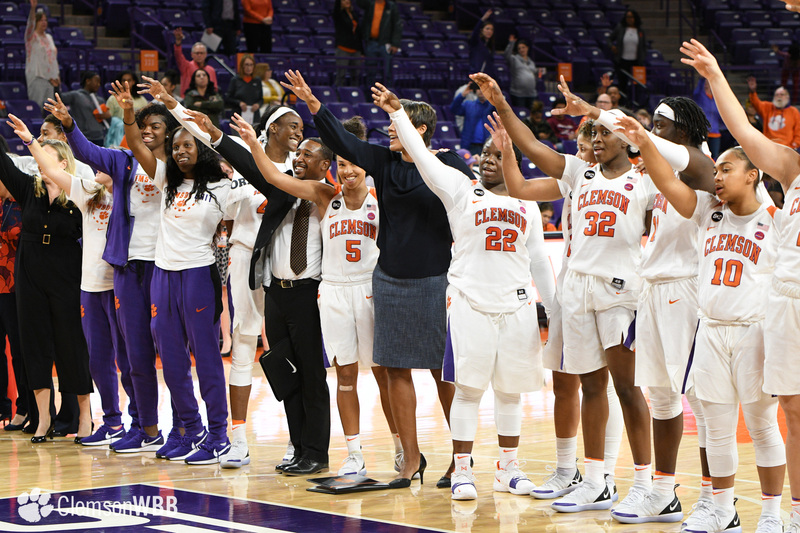 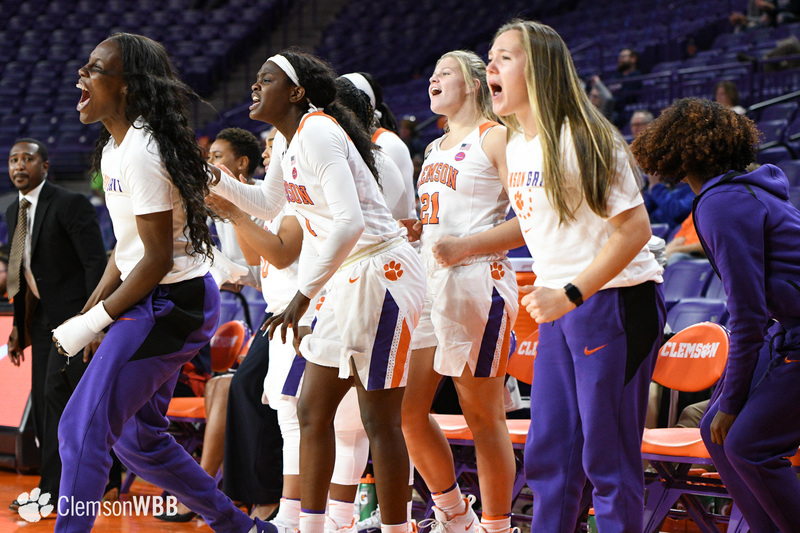 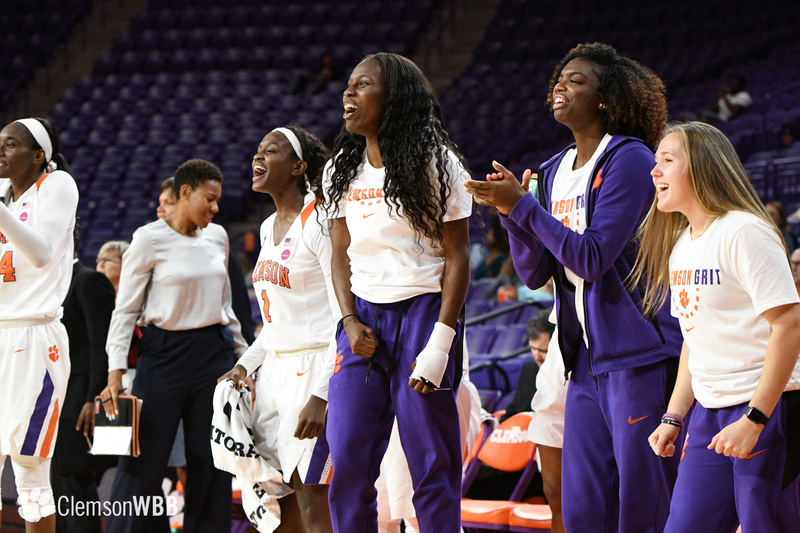 Get the latest news on all things Clemson women’s basketball by following us on Twitter (@ClemsonWBB), Facebook (/ClemsonTigersWBB) and Instagram (@ClemsonWBB).